You should use PredictBGL.com just 'like a pump', entering in BGLs as you take them, and Carbs and Insulin as you have them. If you take a BGL before you eat, use the Calculator to calculate the dose, and adjust it if necessary. These screens are the quickest way to enter data, as they do not require you to enter the time - it is assumed you are entering the data 'as it happens'. Also, the Calculator takes into account your active insulin (Insulin On Board or IOB) as it happens, as well as your BGL target in 3* hours time (*-depending on your active insulin time). If you have to enter data after the events actually happen, use the logs screen. Q. It takes me 20 minutes to eat 20g carbs. Should I enter more than one 20g log entry? A. No, carbs take one to two hours to be absorbed anyway, so you only need a single carbs entry of 20g. Before you can use the Calculator or prediction functions, you need to setup your ratios. You can do this with the help of a Health Care Professional, or see various guides. The Dawn Phenomenon refers to the rise in BGL that occurs in some PWD before or as they wake up. = equivalent to 10.35 grams eaten per hour. = equivalent to 34.5 mg/dl rise in BGL per hour. You can fine tune when this DP rise starts and finishes by changing the times above. 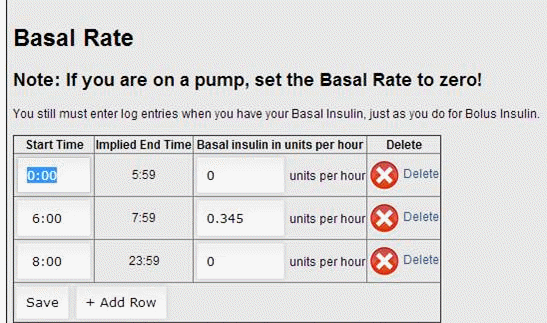 If you are NOT on a pump, then you would reduce your normal basal rate in the hours 6:00-8:00 by 0.345.